Lloyds Paladin Dual has been developed to give the precision adjustment demanded by the requirements of today's fine turf managers. For the best finish an infintely variable adjustment is required to give the perfect cut. This has been developed from the Lloyds Paladin TG but provides the same features as the TG without the groomer being fitted. 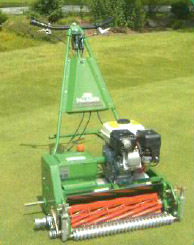 The front grooved roller can be located closely back to the cutting cylinder thus ensuring the shortest roller distance to follow the tight contours of the golf greens.